Once, in college, while I was hanging out with my girlfriend at her parents’ house her mother noticed that I was watching Scooby Doo. My response to this was, “I like Scooby Doo,” probably because it was one of the few sentences that I could coherently make without giggling like a five year-old around a fart. For the next two years that girl’s mother found every excuse that she could to gift me any item even looked like that specially-abled dog’s likeness. I bring this up for two reasons: one that people don’t really know what to buy nerds to show them that they have an active interest in their lives, as they refuse to make an attempt to understand video games or Star Wars, thus ending up in many gifts that barely warrant a “thank you for thinking of me.” The other reason is that this amount of blind gifting can also lead to hating the subject it was once about and why to this day I refuse to watch a single moment of Scooby Doo. The reason that I brought up that entirely long story is so that people can understand that I have no idea how or why I own this anime. It was stored in a large plastic box in the back of a closest that I don’t think I have opened in years. I was amazed and even a little worried on how it got there. 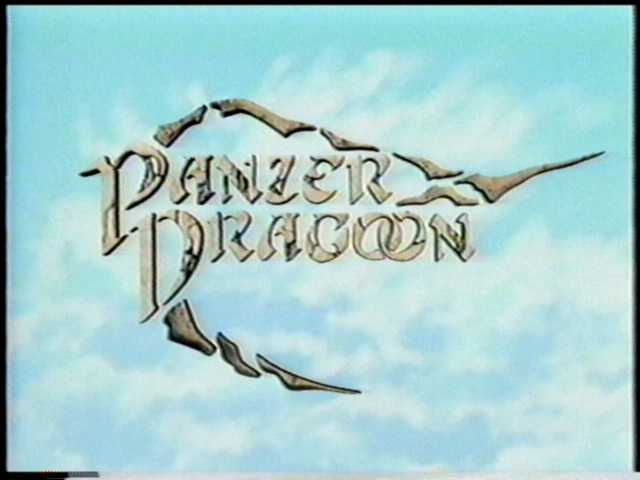 Either way, the anime is based off of the Panzer Dragoon game that had come out on the Sega Saturn– and by based off I mean the same way that a “Fillet o’ Fish” is based off of a “Chicken Nugget”, the idea is there but nothing else. If the game went any further out of its way to have nothing to do with the game it would take place underwater and feature a man made of candy and childhood nightmares. The video begins with a large fleet of ships apparently getting ready to attack a giant black tower, or just flying around and exploring—either way they are actively near it. 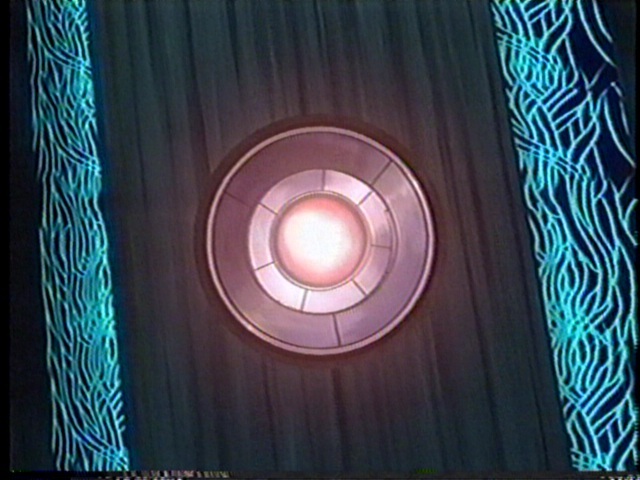 Seeing as the tower seems to be controlled by HAL, who in turn is in control of just about every laser the world has ever seen, he decides that the correct course of action is to kill all humans. This, of course, suddenly switches to a set of people hunting—for food– what appears to be a scorpion made out of 90% rock and 10% poison. Is this hundreds of years later? Is it the next day? Who knows! 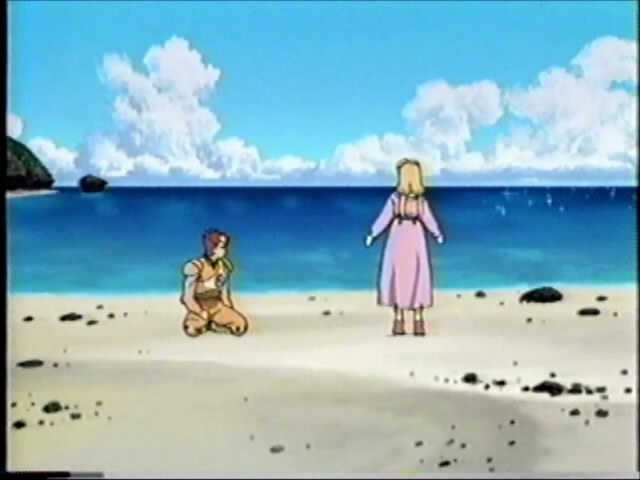 With some of the worst voice acting ever we are introduced to the hero (Kyle), his female friend and only reason he goes on this journey, and worthless/expendable male companion. No, really, it seems like they just hired a couple of people off the street and recorded them as they read lines cold. 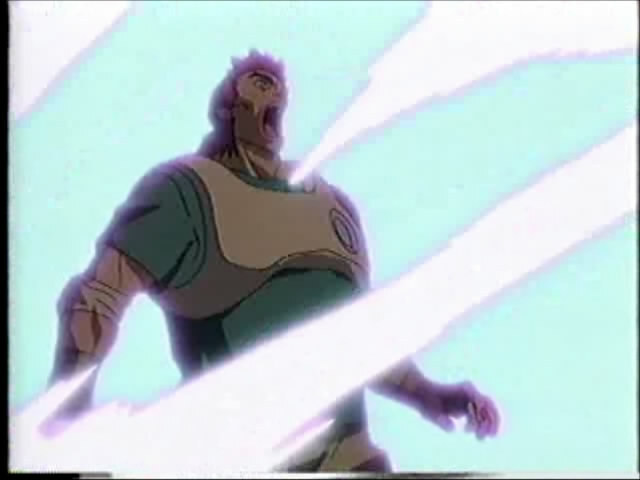 All of the character development that is ever going to occur pretty much takes place in this one scene. Alita (the only girl) seems to be able to sense things, even though that is never brought up again, and the friend who dies when the dragon attacks for an unknown reason and never brought up again ever. 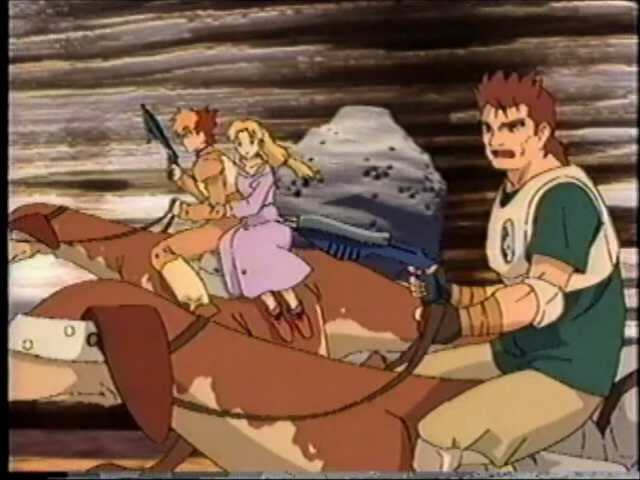 What kind of troubles me, besides the overall quality of this anime, is that our hero is supposed to have been traveling with this friend Devidok (which is only ever pronounced twice, both different ways) for years. He only met this girl, from what I gather from the only flash back during the movie, maybe a week before if you are super generous. He takes 0 time to mourn the friend that gave his life defending him and dashes off to the girl that he could have literally met the night before. Also, while on the subject of not explaining things; why is this girl so special to the dragon? During the only flash back we find out that she is blind, and it is briefly stated that she can “sense the direction of things,” but that is never treated as if it is anything special other than hearing. 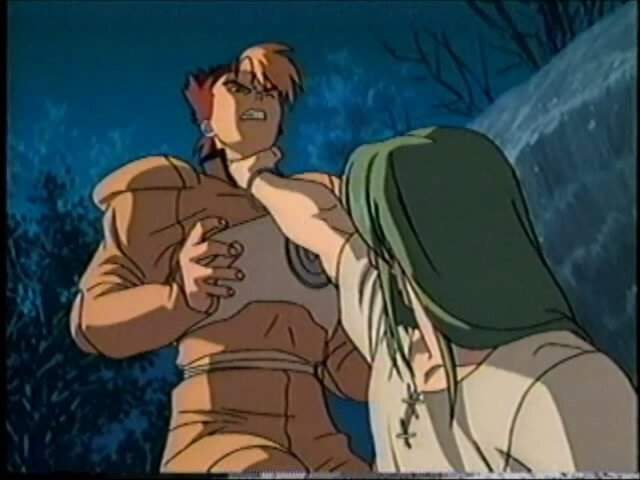 Even the final battle between the two dragons, one of them seems to lose a considerable amount of power and in put through a great deal of pain when she is taken from him. No reason given, just happens and something else happens. The dragon that the hero becomes friends with name is Blau. Oddly this is only mentioned during the last five minutes of the movie, and is pronounced differently every time it is said –by both the human rider and the dragon itself. Beyond the simple issue with its name, Blau is not without problems himself. The rider that he had before the black dragon killed it, and Devidok seeing as I am the only one thinking about his heroic sacrifice here, was never discussed yet he had all kinds of special equipment and armor on suggesting that he had been with the dragon awhile–so someone else that doesn’t mourn the dead. Also, the dragon can talk, but only does so to state that they need to get to the tower fast and during the ending to say good-bye. Here is a thought, when the dragon was killing hundreds of people that it knew to be possessed with demon spawn why didn’t it say something to the hero? Kyle spent an entire day trying to nurse one of those things back to health, only to ask Blau to kill it when he figured out what was going on. If time really was important it would have probably been easier, and faster, to just say something instead of stand around like you knew better. I guess dragons are just naturally jerks though. Honestly though, the best part of the entire movie is that it is short. From the time that Hal blows up all the stupid looking steam punk zeppelins to the moment stood blind girl can finally see is about 15 minutes. The box says that it is 35, but that seems to be with both the previews of other anime and the seven minutes at the end that goes through all the concept art, and then shows the scene it was from.